Football/Soccer Session (Moderate): ISP 23 Diagonal moves revision. 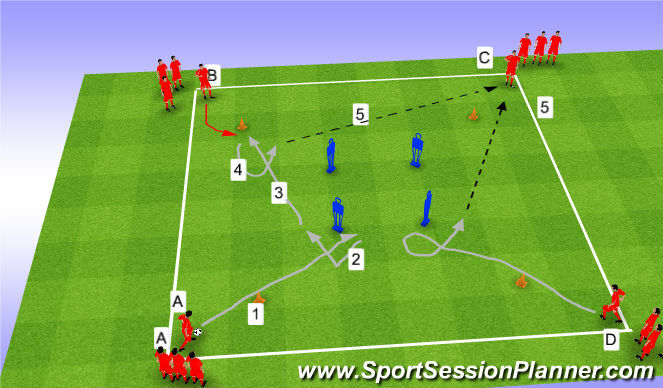 USes a heading game as a warm up, and a coerver box to revise 4 diagonal moves. Also emphasises use of weak foot. 15x20 area with fairly wide cone goals. 2 channels. Teams of 4 or 5. Players pass the ball by heading to a team mate who must head on or head to himself and then catch. No running with the ball. No catching unless receiving a team mates header or an opposition mis-header. Score in the cone goals. 15x20 area, 2 channels so 4s team can compete. 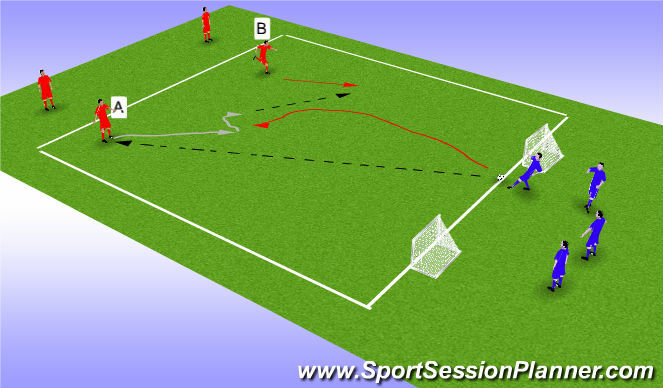 Red dribbles forward to stop ball between red cones and spin to defend. Blue follows to collect ball and attack red to get thru gates A or B (1 point) or C (2 points). Ball must be under control to score. If red wins ball back he can attack any gate and get the point. Allow 1 min per team then swap, adding up points. Each team to play each other. 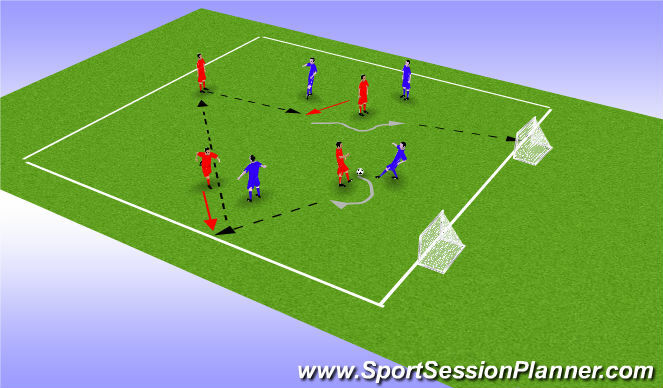 Basic coerver box , group in each corner, with each group performing the same movements at the same time. Each group initially works as per D>C. Progress by using other foot and ball moves other way round the area. 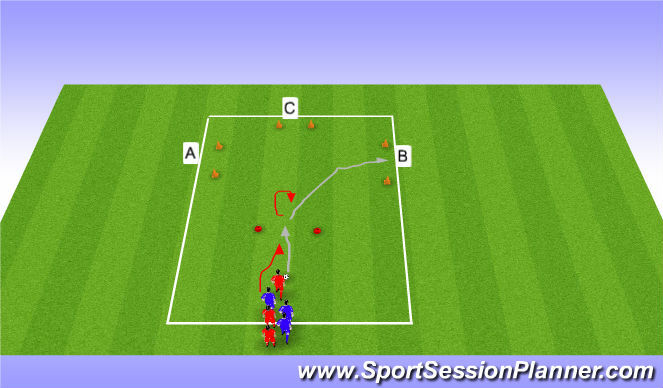 A runs with ball towards B who closes down to prevent A going left ie closing down 1 option. A can use any 2 moves to turn and protect ball and pass to C.
*Receiver concentrate - close down 1st player, retreat to corner, then receive from 2nd player - check out/in - trigger is A head up/shape to pass. 20x20 area with 2 goals. 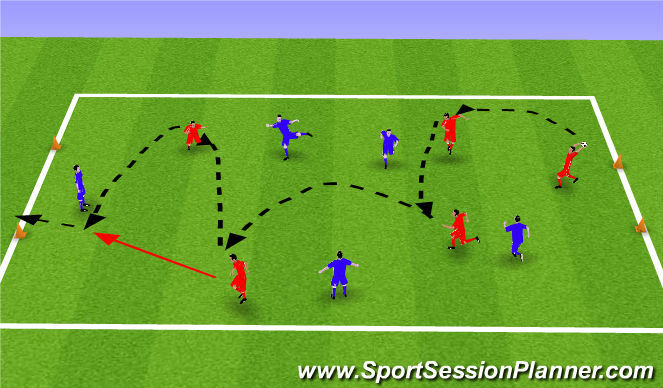 Defender pass up to attackers who combine to score in either goal. Must make at least 1 pass. Must score with weak foot. If defendef wins ball he can score in either goal. *Defender to isolate player on ball, and not dive in. Play 1 min per team then swap. Progress by 1 touch weak foot finish. 20x20 area. (limited area this week , would normally use 30v20. Changeover game. Blues can score in either goal, but must be weak foot finish. Reds can become attackers by winning ball, then playing wide and moving ball to either of the other 2 sides without goals, before attacking either goal.